Phoenix, AZ – After being fired for brutally stomping a teenage suspect on the neck as he was fully complying with orders, Phoenix Police Officer Kevin McGowan is back on the job. Just this May, The Free Thought Project reported on this excessive use of force and McGowan’s subsequent termination. 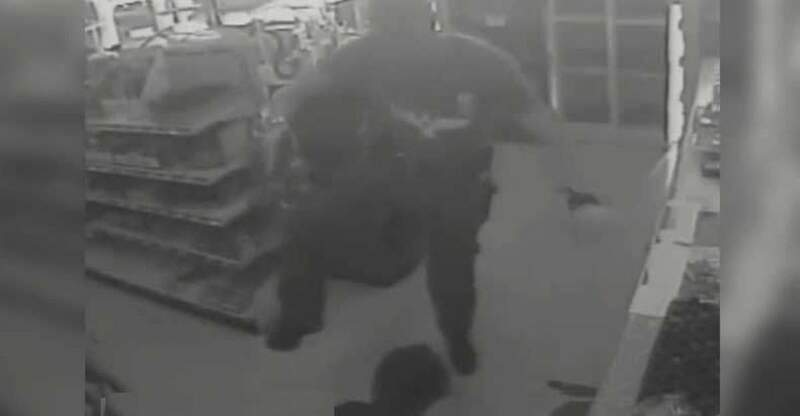 Surveillance video shows suspect Patrick D’Labik with hands up, going to the ground as commanded. McGowan then approaches with gun drawn; brutally stomping the back of D’Labik’s neck, driving his face into the floor and knocking out several teeth. McGowan had attempted to question the teenager about a homicide suspect, but D’Labik ran away because he possessed a dried plant deemed illegal by the state, so was fearful of getting in trouble. McGowan chased D’Labik into a store and assaulted the teenager as he was calling his father. Even McGowan’s coworkers at the Tactical Training Unit found the use of force unreasonable. McGowan pathetically attempted to use the national awareness of police brutality to defend his own actions, suggesting he was under a heightened sense of awareness of violence toward police. It’s difficult to fathom why this would necessitate stomping a person’s face into the ground who was not only unarmed, but in full compliance. However, an “independent expert” from the Chandler Police Department thought the use of force was reasonable, and a criminal report alleging aggravated assault was declined by the county attorney’s office. When McGowan appealed his termination to the Phoenix Civil Service Board, they reinstated him. Apparently the opinion of those who work with and supervise McGowan are irrelevant, which shows how the Blue Apparatus keeps its most aggressive in uniform. The Phoenix Civil Service Board has reduced punishment for officers in 70 percent of 20 cases between January 2013 and October 2014. A prime example is when the board reinstated a Scottsdale officer who was fired after becoming road-raged at another driver while off-duty, following him to his destination and pulling a gun out. This pattern of accommodating police aggression prompted former Police Chief Daniel Garcia to publicly lash out at the board. He was fired for insubordination. Again we see the good cops weeded out, while the “bad apples” are rewarded. This kind of positive reinforcement for violent behavior is guaranteed to raise incidents of police brutality, not reduce it. Kudos to Former Chief Garcia for bravely taking a stand and speaking out in an attempt to stop this epidemic. Officer Kevin McGowan is a violent criminal, and should be taken off the streets before he hurts anyone else.